So I was on a mission this weekend to find a mirror for the downstairs bathroom and a few other pieces that we need for downstairs. My friend Jeannie was having a sale at the Pink House. I went with a plan. I went with a very detailed list and what did I see? 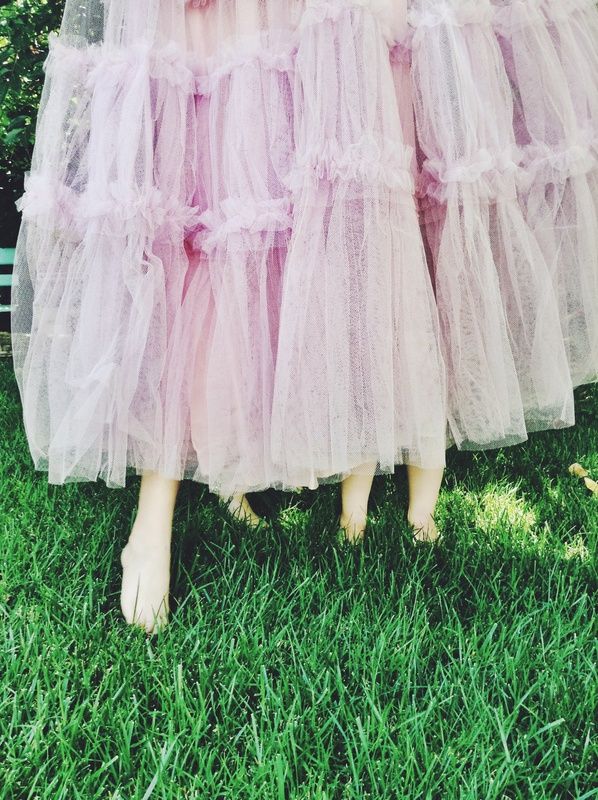 An amazing light pink vintage dress made of tulle…LOTS of tulle. My heart went pitter-patter. My mission was… distracted. I had walked away from this same dress about six months ago. I made a promise to Stewart at that time, that for two months, I wouldn’t spend any more money on clothing. Given I had just gotten back from a trip to Italy with my friend Jason, where I spent way too much money shopping, I thought it was an easy promise to keep. I had enough to tide me over. That’s actually where this promise originated. Jason had to work in Italy so during the day, I was own my own to shop, site see, etc. I mostly shopped. Ok but everyone that knows me, knows I need a chaperone when vintage shopping in Italy or anywhere for that matter. Technically not my fault! Anyway, I was heart broken when I couldn’t get this dress. Trust me, I tried everything to convince Stewart that this was not breaking my promise because you don’t just run into these things everyday. When my two month promise was up, I went back to find it. It wasn’t there. I was devastated. 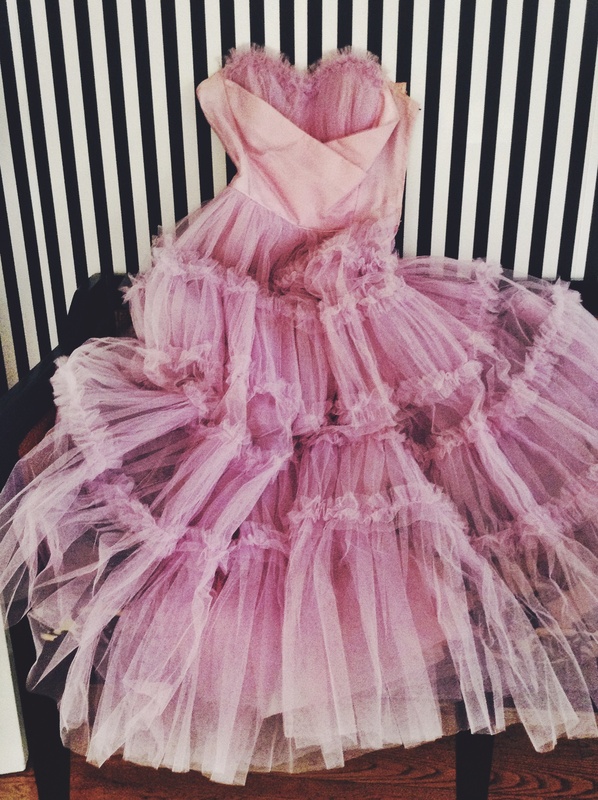 Dresses don’t just walk into your life like that and then reappear in another shop, if it isn’t supposed to be yours. It was a sign! I bought it! Now it’s mine! I feel like my kids do with a new toy. There is a photo shoot for SMID on July 27th. I am lucky to be working with Ranata Stone. I think she is one of the few photographers that gets it. She will understand how to capture me and what I want to capture when showing my work. She will mostly be shooting my design work for the development of my website and my portfolio however, I will be in a few pics. I plan on wearing this for some of the shoot with my cowgirl boots. Are you feelin’it? I may want to cut the top off to make this into a big skirt so I can wear with a t-shirt. I’m not sure yet. As long as I can get the elastic waist in there in time for the shoot, I may. But, it’s really great just like it is. Well, this is true. I do put coasters on trays. I also double up coasters and I triple up trays. It’s a layered and more textured approach. It makes things look a bit more loved and more fun. And by the way, these are not any old coasters or trays for that matter. They are hot vintage coasters, family heirlooms, memorabilia from travel, or just unique fun pieces that add a bit of flare. They look great and they make me smile. 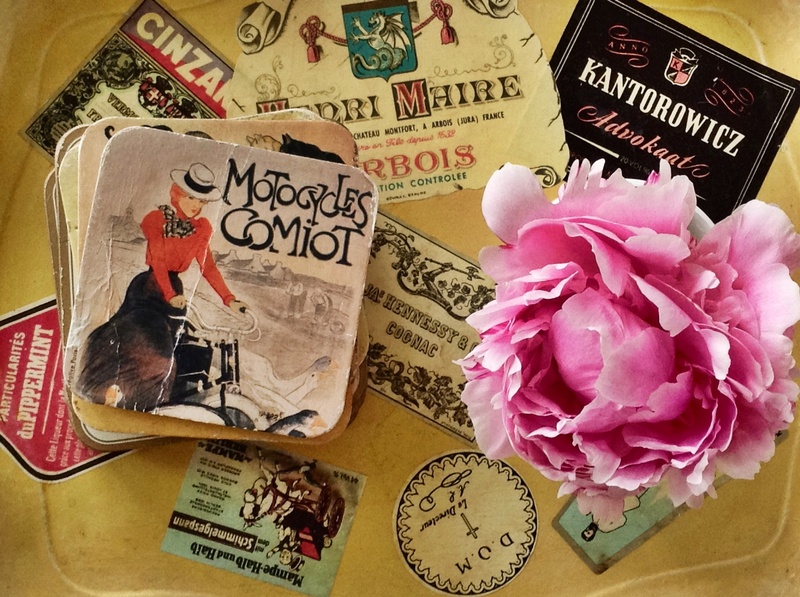 I am sharing an inexpensive vintage tray that I picked up one day antiqing and coasters from a trip to paris. Individually they are ok. But paired together, I think they really play off one another and make my table pop. The coasters almost look like they are jumping out of the tray creating a lot of depth and making it more interesting. 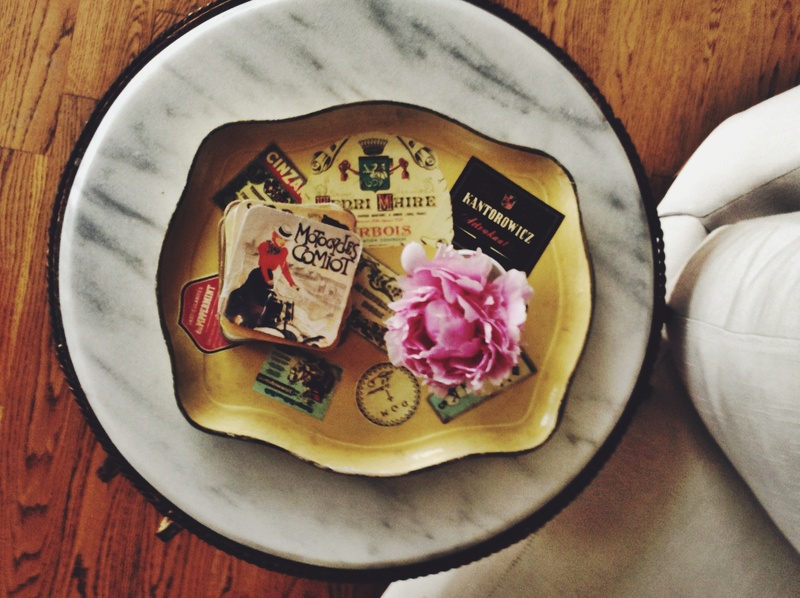 I put a pink peony in a white polished cup to offset things a bit. It brings attention to the tray in my opinion. Don’t you just want to put your coffee cup there? Do you get excited to see the peony pulling out the pink in the painting? I do. You know when you have that feeling, that if one thing could get done, everything else would fall into place? And when that one thing is being held hostage or by your own indecision, that one thing is delayed, leaving you with the sense that it won’t ever come together? It’s crippling. Well, before SMID, It’s been frustrating, but I have distracted myself with shopping, taking apart another room, rearranging furniture or coming up with my next big design scheme that I won’t be able to afford until I’ve recuperated from the current project. Now, with a launch party date hanging over my head and a long laundry list of things that need to be done before the event, it’s REALLY OVERWHELMING. 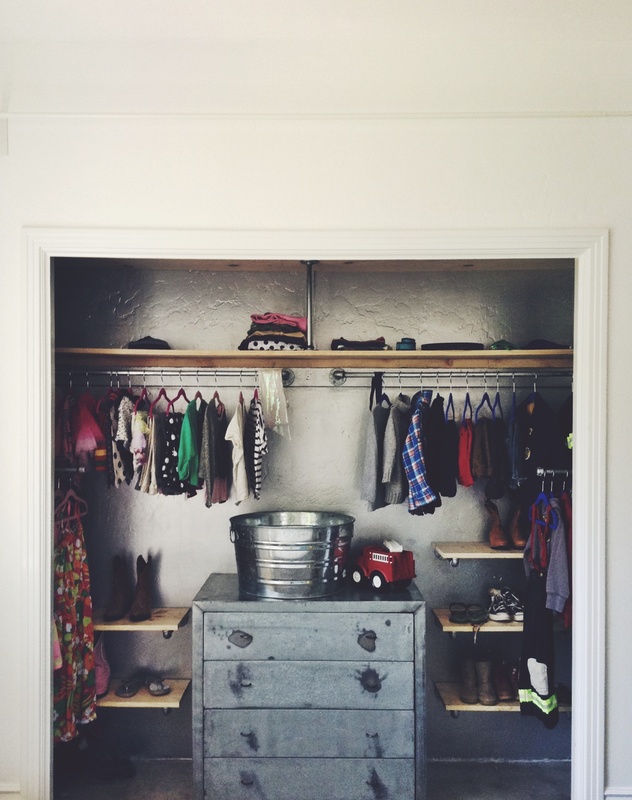 This is happening with a few areas of Project SMID but I am feeling it the most with my kids room. I have a great plan and vision for this room. I created my story board. I bought amazing pieces. I know it will look incredible when it’s done. But just the other day, it hit me. I need dark blue velvet curtains to finish this room off…perfectly, not the white sheer that I was originally planning on. I have to have these velvet curtains. They will bring warmth to the industrial pieces, ground some of the carnival pieces I found, help tie the kids room into the grander theme of the downstairs and just look, damn good! Of’course, with the way I have designed the curtain rods, we cannot install them until the curtains are here. The kids have been sleeping in my office upstairs due to the renovations. We do not want our kids to move back downstairs until the windows have coverings. There are so many things out of place right now. Can you see the dominos? But these curtains, will make this room and that’s that. So now that I can’t get these curtains out of my head, it’s on. In my experience and confirmed again through my recent obssessive curtain research, I decided to have them custom made. I tried to avoid it. 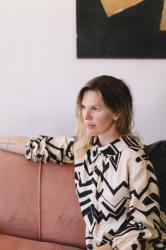 But, if there is something that I know all too well, it’s not to cut corners or go cheap when it’s where it really matters or is a huge focal point of the room. You don’t want to go cheap when you know there is something you love way more. Don’t do it. Don’t be tempted. You will regret it! I always have. West Elm has gorgeous blue velvet curtains that are the right length, the right color, the right luster but they have grommet finishing at the top. I didn’t want to use that finish for this room. I even considered ordering the longer length and then cutting the grommet part off and having someone refinish them because the color was so beautiful but, I would need too many panels to cover the two large windows in this room The panels wouldnt fall together as well as they should. So I am getting them custom made. Although a more painful process, this is the right move. This move has put a huge dent into the budget and the timeline. I could get into the details now but I will spare you until the curtains are ready, so that you too will appreciate why it is worth the wait. So….I am focusing on taking one step at a time and getting as much done as I can. Then when the curtains arrive, the kids move back downstairs and everything will fall into place. LOL – that felt great. 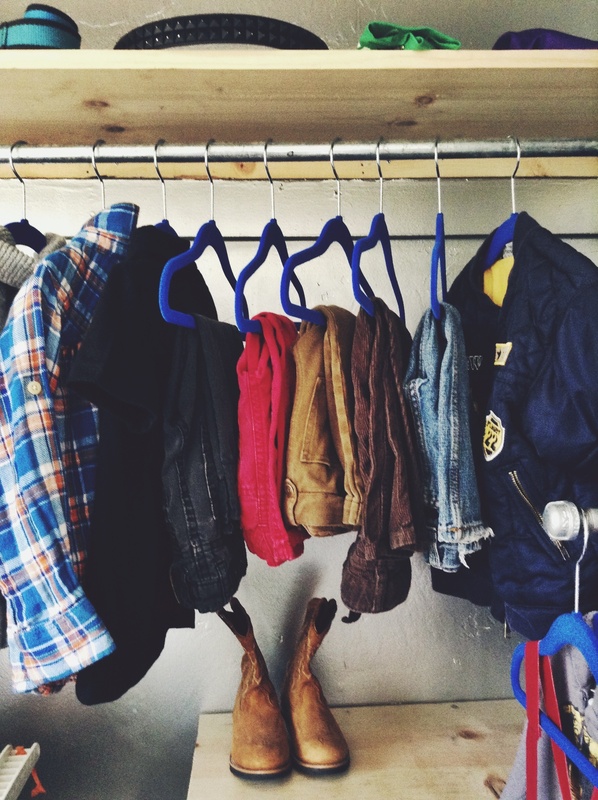 Anyway, I am so excited to show you the project we completed this week; my kids’ closet. 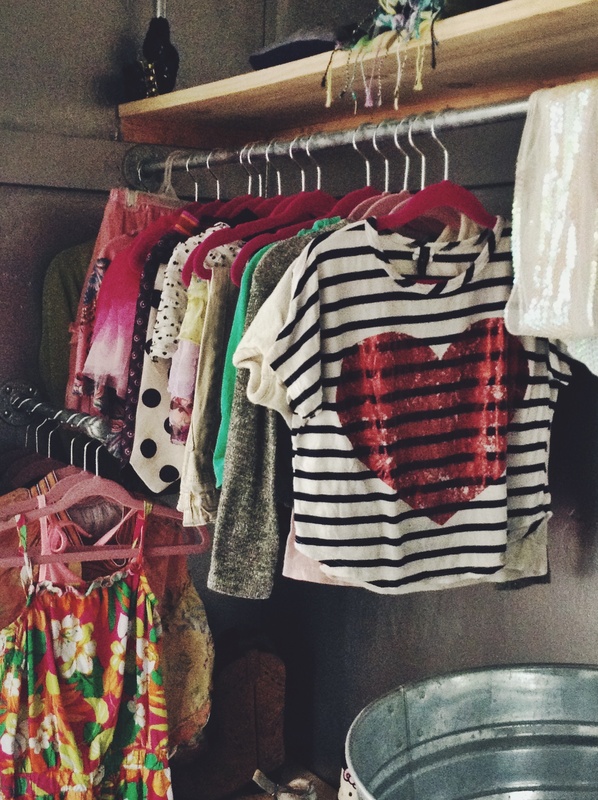 I designed the kids’ closet along with my super nanny Rachel Lunghi also of Lace and Likes, hand made weddings. Rachel has been a huge force for me and my cheerleader during the conception stage of SMID. We wanted to do this project together since we both use their closet so much and are often the ones finding the “lost” items. For me, every little detail counts. Every space of my house should make me smile. 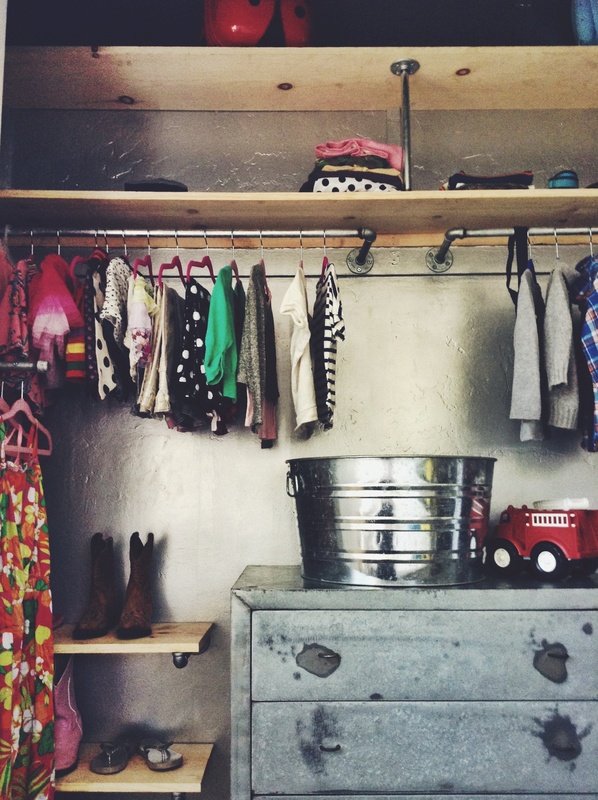 I wanted this closet to be fun for my kids but still fit into the broader theme of the house. It also needs to grow with my kids so that in three in years time, we are not talking about redesigning it or about it not being cool. This is also for my little guy and my girl. They share a room. So I made sure it wasn’t too feminine or masculine and that it represented both of their tastes and mine. A closet needs to be functional and you need to be able to see what you have in there so it gets used and doesn’t give you a headache when you go to find things. 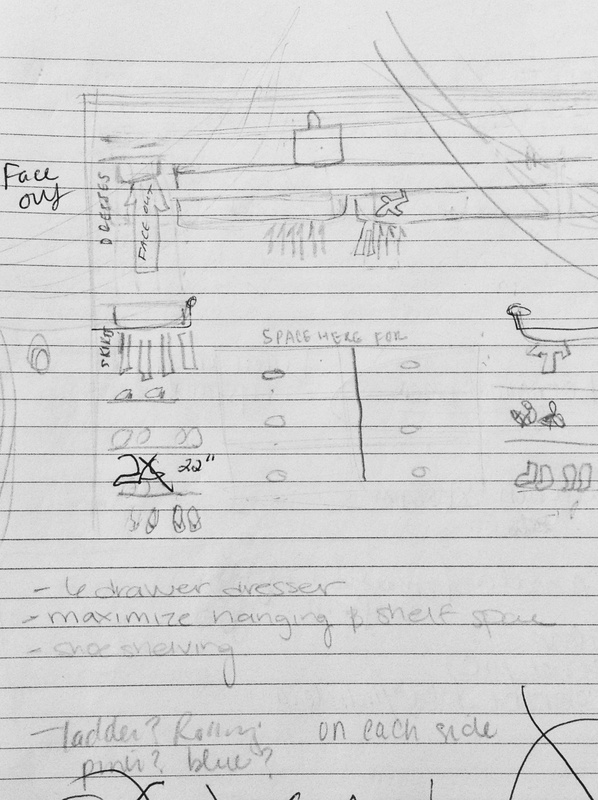 Rach just wanted to make sure there was a place for everything so we can keep their stuff from going everywhere…HA! I think we found the perfect balance. It’s simple, functional, glam and tough as nails. I’m really excited about how it turned out. So are my kids. That’s one solid next step for Project SMID. Take a look and let me know what you think. Here’s how this design originated. I drew a picture to capture the main idea. Some things changed as the build was underway to actualize the functionality. I used raw wood for the shelves and plumbing hardware for the clothing racks. 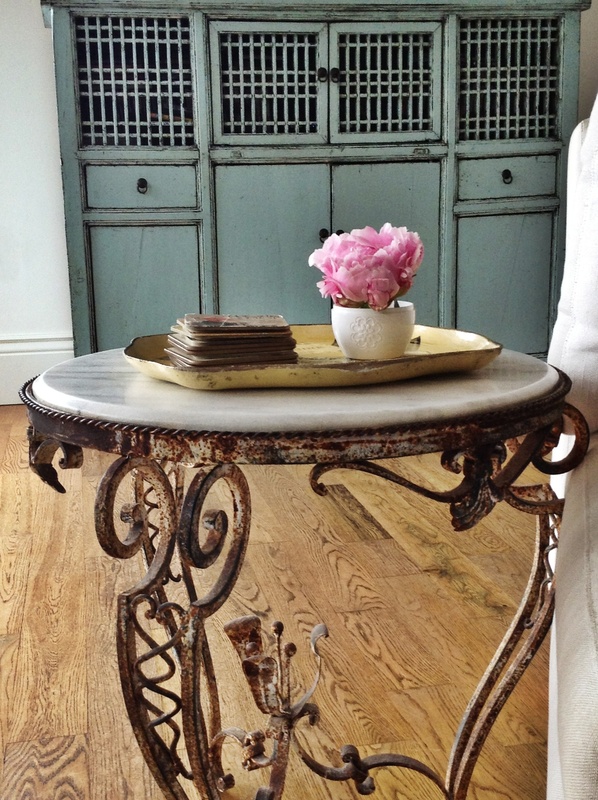 This brings an industrial feel and consistency in the design of the downstairs space. There are exposed beams, plumbing, and conduit in other rooms. Face outs were installed on both side walls of the closet for dresses and longer pieces so they are visible without hanging over or hiding the shoes on the shelves. I chose metallic silver for the walls! 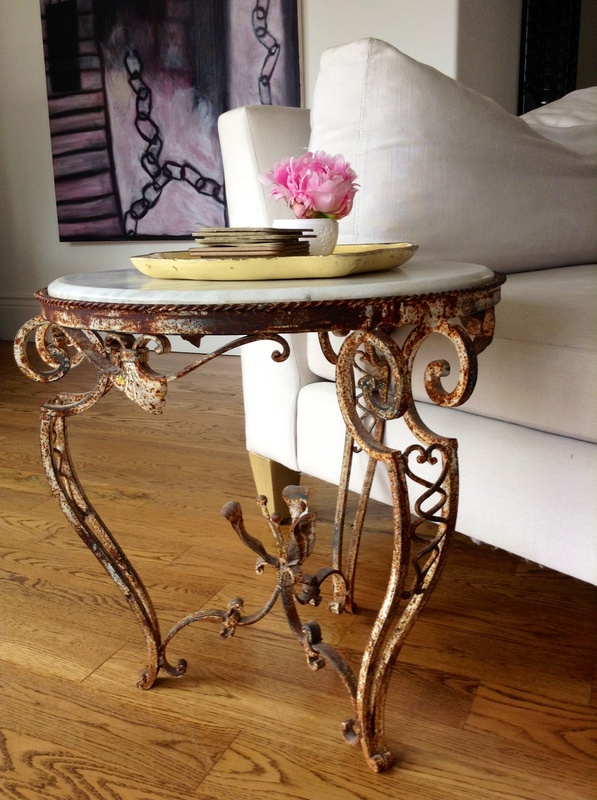 This glammed it up a bit and softened the industrial hardware. I love the silver so much I want to paint everything with it. Don’t worry – I won’t actually do this. There are pink non-slip hangers for my girl and blues for my guy. Yes, I had to. 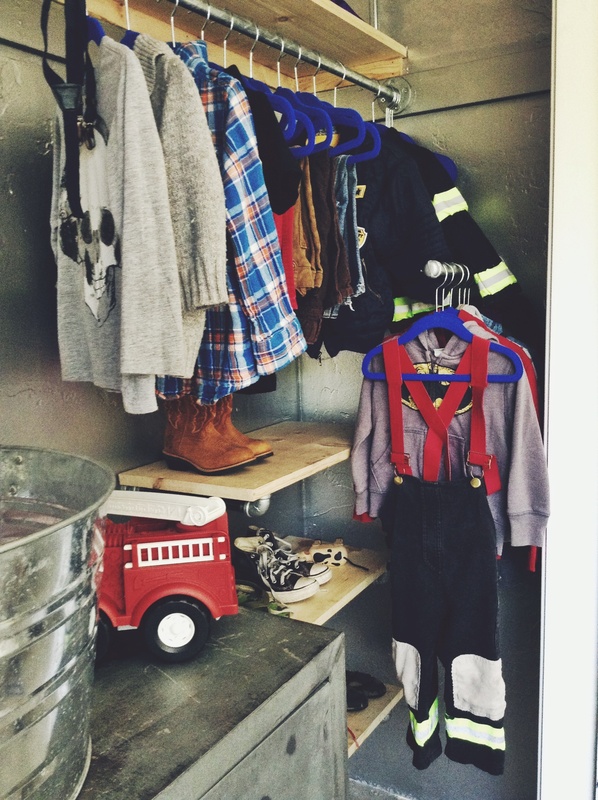 The silver bucket is for dirty clothes and the firetruck makes me smile.